Later, flanked by his three children on Father's Day, a cigar between his lips and winning net as a necklace with the lingering stench of champagne, James began to understand the magnitude of his accomplishment for Cleveland after a half-century wait. "I'm coming home with what I said I was going to do," he said, adding, "I can't wait to get off that plane, hold that trophy up and see all our fans at the terminal." James delivered on a vow to his home state and brought the Cavs back from the brink as they became the first team to rally from a 3-1 finals deficit, beating the defending champion Golden State Warriors 93-89 on Sunday night to end a 52-year major sports championship drought in Cleveland. "I've never seen a man in my life tell an entire state: 'Get on my back, I got you. Get on my back and I'm going to carry you. I don't care if we fail, I'm going to wake up the next morning and I'm going to start working out and prepare for the next year,'" Richard Jefferson said. "... He was like, 'I'm going to come back home because I promised them that I would do something.' And he carried us the whole way." 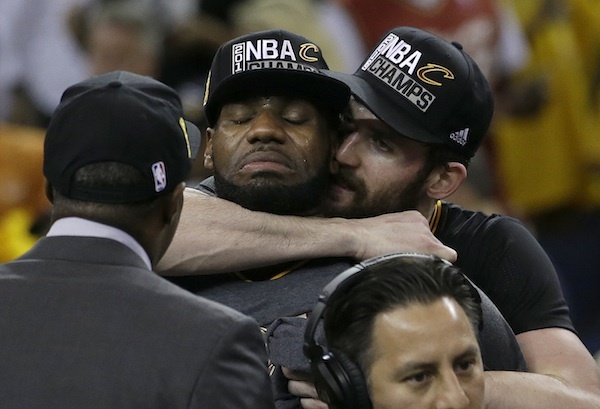 The native of Akron rattled off moments from the lengthy list of Cleveland sports heartbreak and said what it meant for him to personally bring the Cavaliers their first championship. Playing his sixth straight finals, James almost single-handedly carried the Cavs back into this series and finished with 27 points, 11 assists and 11 rebounds as the Cavs gave their city its first major sports winner since the Browns won the NFL title in 1964. He also had three blocked shots, including a key one of Andre Iguodala on a fast break in the final minutes. An emotional James fell to the floor when this one ended with a second win in a week on Golden State's imposing home floor, surrounded by his teammates. Only moments earlier, he went down in pain with 10.6 seconds left after being fouled by Draymond Green while going for a dunk, then came back out to make the second of two free throws. "I was calm. I was focused. I was locked in," James said. "It hurts, man," Curry said. "Just proud of every single guy that stepped foot on the floor for our team this year. ... Hopefully we'll have many more opportunities to fight for championships and be on this stage because this is what it's all about." As Cleveland celebrated in the trophy ceremony, Green returned to the floor to congratulate the Cavs. He stopped by the winning locker room, too, and Warriors general manager Bob Myers brought in the freshly cut nets. Golden State might always be remembered as one of the best teams ever that couldn't close it out, and Green is taking at least a good share of the blame after he sat out Game 5 on Monday night suspended for flagrant fouls. Cleveland became just the fourth team to win an NBA Finals Game 7 on the road. President Barack Obama, an avid basketball fan, returned to Washington aboard Air Force One late Sunday as the game entered its final, tense minutes. He watched until the end and did not come down the stairs until moments after the Cavs won. This time, it will be Cleveland hosting the victory parade on Wednesday. A year ago at home, the Cavs had to watch Golden State win its first title in 40 years. "Now we have our own parade," Irving said, "and we'll celebrate it the way it's supposed to be celebrated in Cleveland." Cavaliers: James missed scoring at least 30 points for the first time in his last five Game 7s. ... The Warriors and Cavs faced off in their 13th finals game in two seasons, matching the highest total in NBA history over a two-year span. Warriors: Golden State played the first finals Game 7 in franchise history. ... Not since the Oakland Athletics won the World Series in 1974 has a Bay Area team won a championship at its home venue.